The last two decades have seen an increase in incidents of terrorism. Despite the efforts that have been put towards fighting these barbaric acts, they seem to get worse by the day. While there might be no end in sight, it is important that we keep up the good fight and not give in to the enemy. We must all unite against terror. One of the greatest quotes about terrorism and the importance of uniting gainst it. It is not affiliated to a religion. The real definition of terrorism. We should take the war to them. Let us focus on hope other than fear. It has no face and is not preserve of certain countries. We must kick it out. Terror is an attack on liberty. We should not change our way of life beacuse of terrorism. Making peace is not an option. Killing one innocent person is an affront to humanity. Being Muslim does not make one a terrorist. Interference in other people's way of life breeds terrorism. Education can help erase terror. Terror is feuled by ignorance. To eliminate it, we need to educate the masses. The fear iduced by acts of terror is the actual terrorism, not the act itself. 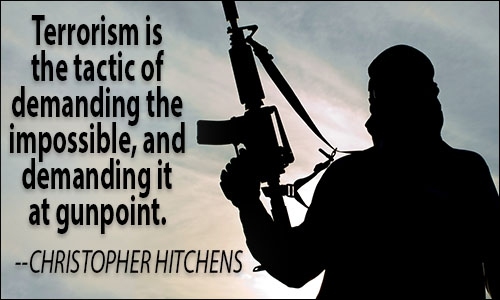 One of the wisest quotes about terror - we can't fight terror with terror.